Now, vanilla extract is readily available, and can be found in almost everyone’s cupboards already. BUT once you learn how to make vanilla extract you can make a superior product for less money in your own kitchen at very little cost that will wow and bless all your friends this Christmas. At the risk of being tacky, I’m gonna answer all your questions about how to make vanilla extract–those of you who will receive a bottle from me please dis-remember this post because my mom taught me it was poor taste to tell someone how much you spent on a gift! 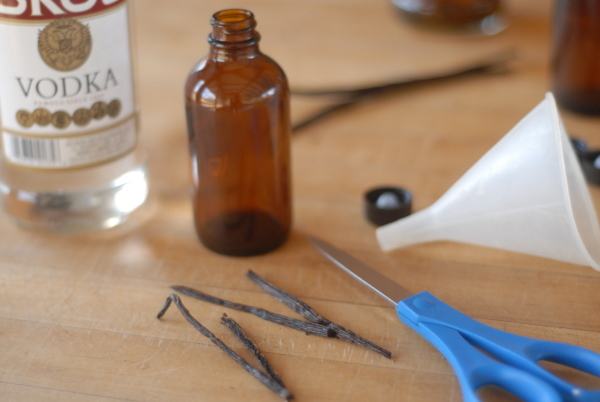 Can you really make your own vanilla extract? 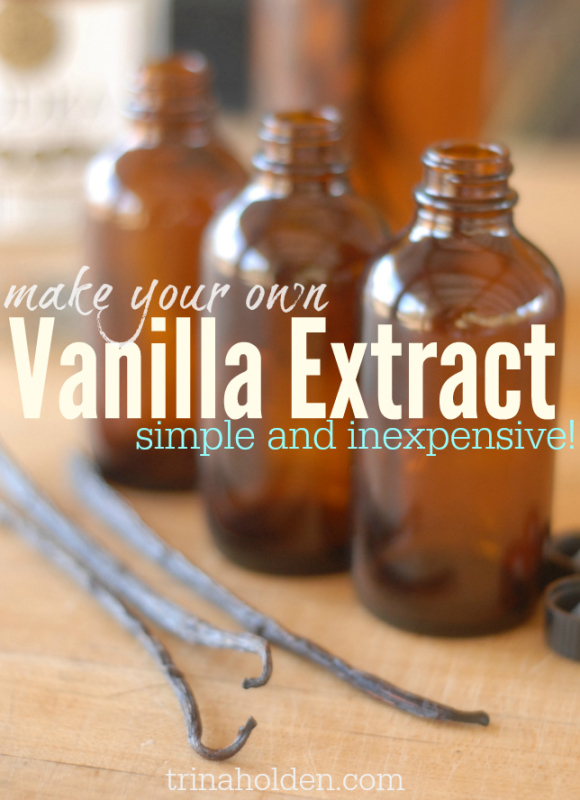 What do you need to make vanilla extract? What kind of vanilla beans do you buy? To my understanding, there are three main types of vanilla beans. I use the Madagascar or Bourbon bean as it creates the same flavor as you would normally get in the grocery store, and is in the middle price range. I purchase my beans in bulk from Amazon–if you order a whole pound at once, you have enough beans for YEARS (ask me how I know) and they cost less than $1 each. The beans are fragrant and moist, and keep for several years (again, ask me how I know!). 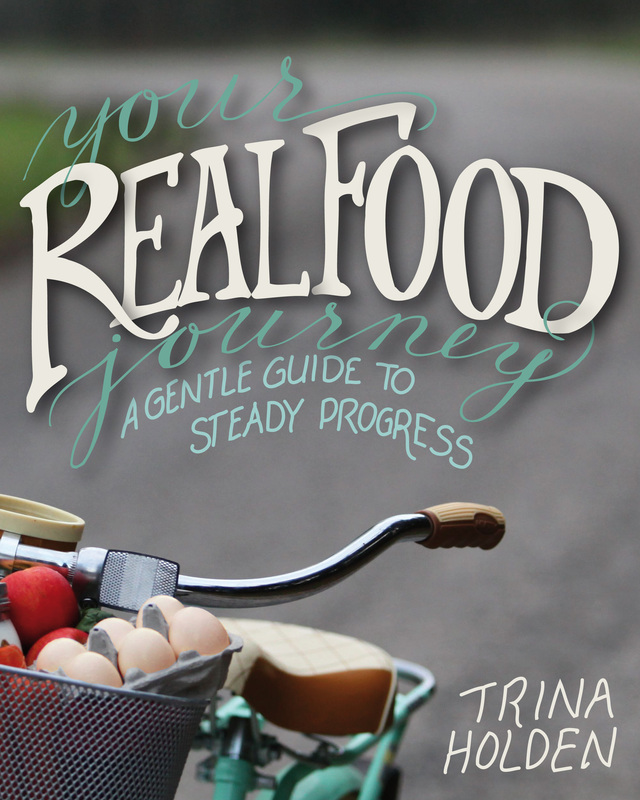 Here’s a link to vanilla beans on Amazon. 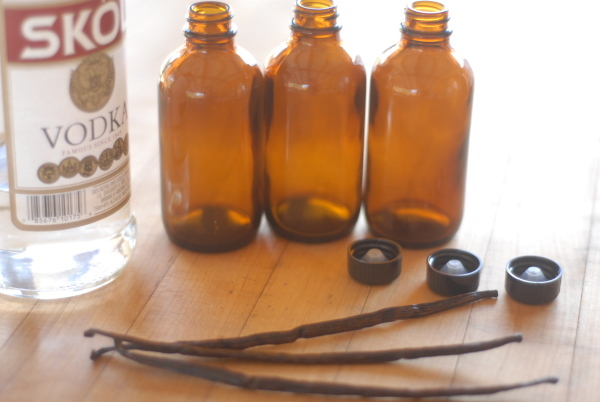 What kind of alcohol do you use to make vanilla extract? 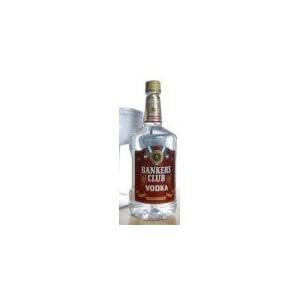 I use vodka because it gives me the most straight forward vanilla flavor. You can also use bourbon, but it’s gonna taste a little different than store bought extract. The key word here is “cheap”. Any brand will do. I buy it in the largest bottle my liquor store carries, when it’s on sale (I watch the ads). I got a 60 oz bottle for $17.82. For those who’ve never been in a liquor store or bought hooch before (like me) it’s clear, like water, and my bottle looks like this… Feel free to inform the cashier what you’re really going to do with 3 liters of vodka while you check it if it makes you feel more upstanding. 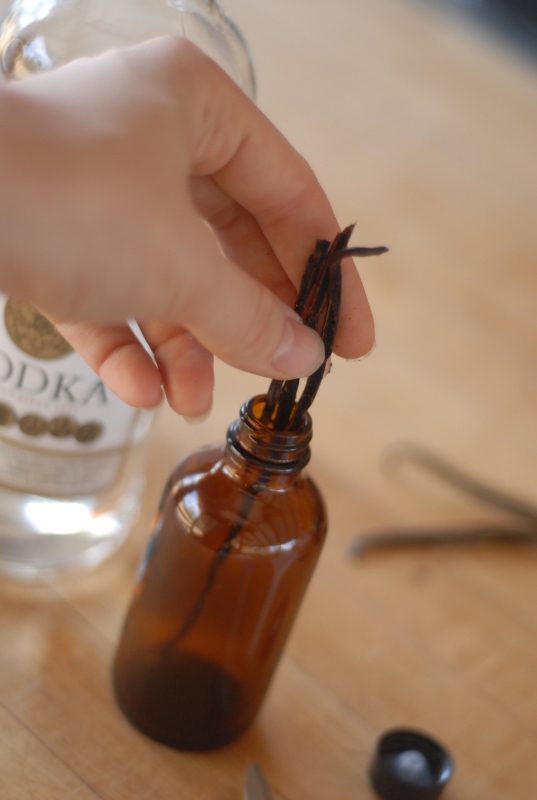 How do you bottle vanilla extract? If you’re making the vanilla for yourself, you can use any old glass jar, or just throw the beans right into the vodka bottle! But if you’re gifting, you’ll want some nice little 4 oz. bottles. I bought beautiful, blue, recycled glass jars with corks one year, but ever since I’ve been using amber jars with nice little caps–this way we can use the jars over and over. Again, Amazon has great prices and selection–here’s a 12-pack of the kind of jars I use. Pay close attention ’cause this is really simple. 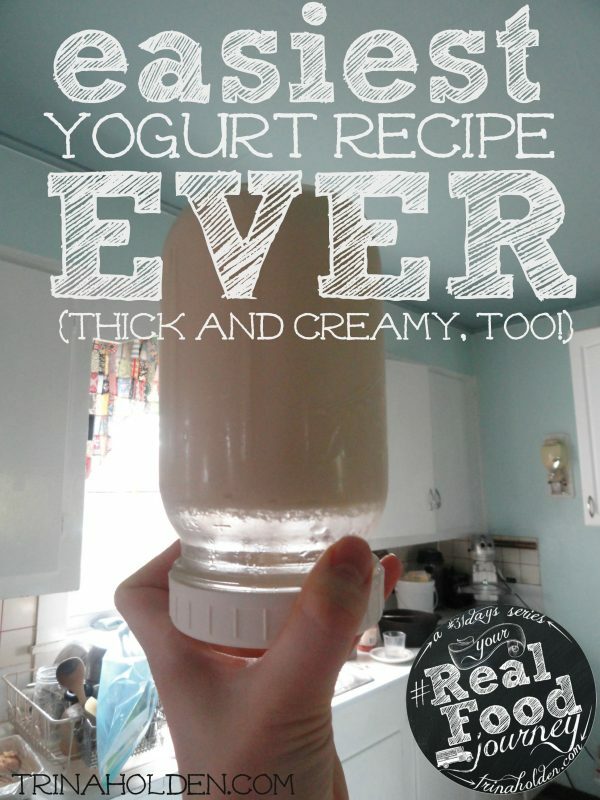 Put all four pieces into your 4 oz bottle. Well, the vanilla needs to steep for 4-6 weeks, with an occasional shake. The first year I made my extract in October so it was all ready for my recipients to use in their holiday baking. I’ve not been quite on top of things since then, so I just tell people to save it till January. They don’t seem to mind and like feeling involved in the process (“Shake it once in a while!” I tell them. They think it’s so cool). I also tell my friends that when the bottle gets half empty, they can add more vodka and let it set for a few more weeks to get the most out of the beans. 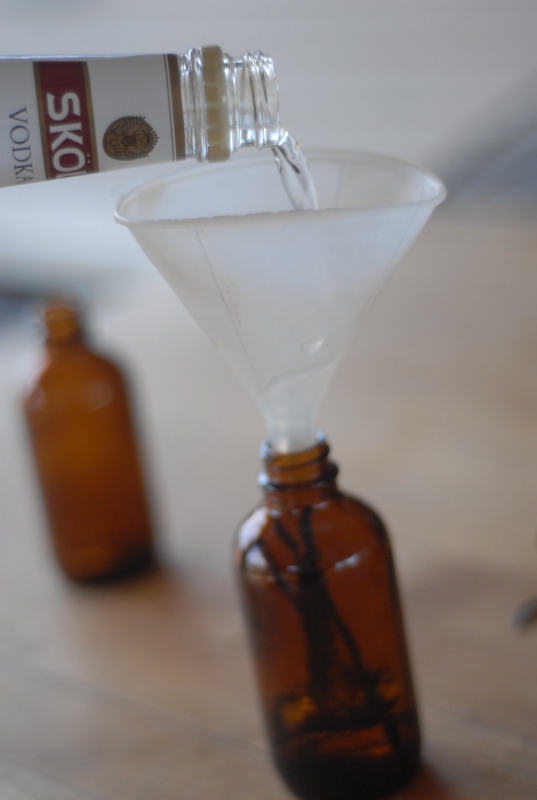 How much does it cost to make Vanilla Extract? I know — it’s almost laughable. 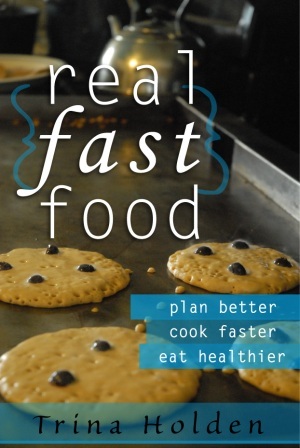 A comparable product (pure, without any additives) goes for $10-13! 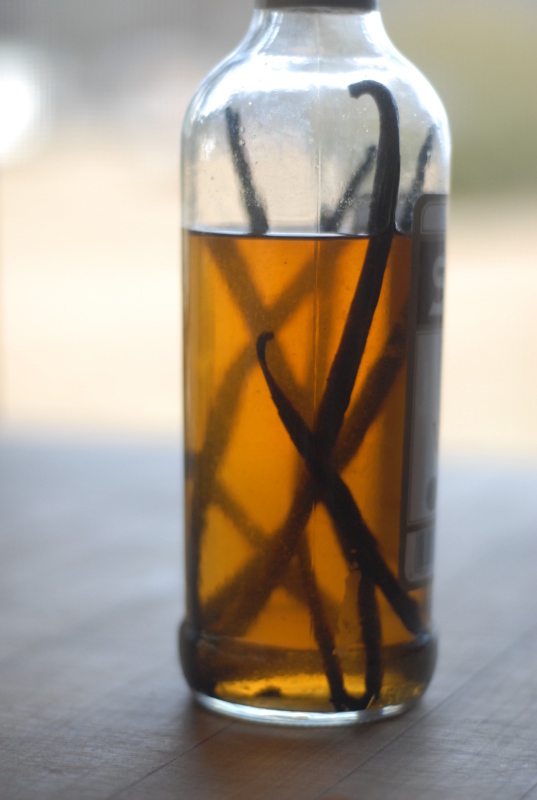 If you want to make a large batch of vanilla extract for your own use, you can just put 12-15 beans, snipped lengthwise, straight into a 60 oz bottle of Vodka, or pour it into a quart jar or two. I’ve made the making and gifting of vanilla extract a yearly tradition at our house for many reasons, but my favorite thing about it is that it’s something my kids can do with me. My kids snipped the beans all by themselves this year while I poured the vodka in the bottles. 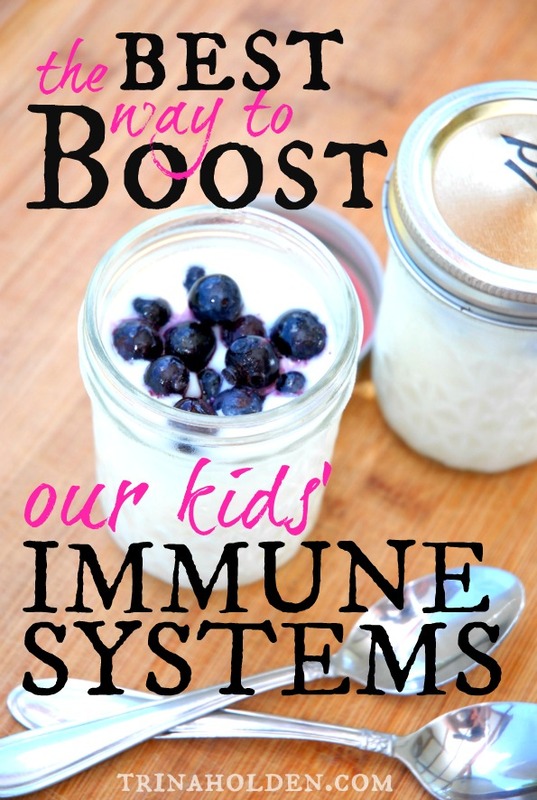 We did this together with friends a while back and between 3 kids (ages 5-7) with scissors and two mommies we made 30 jars of vanilla in 20 min. And boy, did we all smell good when we were done! This is just one of the many ways I simplify Christmas so that I don’t get totally stressed out during the holidays. I’m sharing all my secrets with you this week ’cause I want you to have a peaceful Christmas, too! This post includes affiliate links. Using a bloggers affiliate links to amazon or elsewhere for your shopping is a great way to bless your blogging friends at Christmas time! What’s your best strategy for simplifying Christmas? Ya’ll have been sharing some great ideas in the comments – I appreciate all the feedback and I’m takin’ notes! New Year’s always seems one of the more dutchy holidays to me, because while at Christmas Dutch traditions look a lot like everyone else’s (stockings, Sinter Klaus, special pastries and desserts), at New Year’s our family did stuff no one else did. Dutch stuff. First there is Ollie Bollen. Traditionally served New Year’s Eve or for breakfast New Year’s Day, these doughnuts are nothing pretty to look at and their name means “Fat Balls”! But their beauty lies in the crispy, funky protrusions formed by spooning a wet, yeasty dough into hot oil, and the plumped raisins studding the mildly sweet dough. The resulting golden-brown creation always reminds me of a manatee. 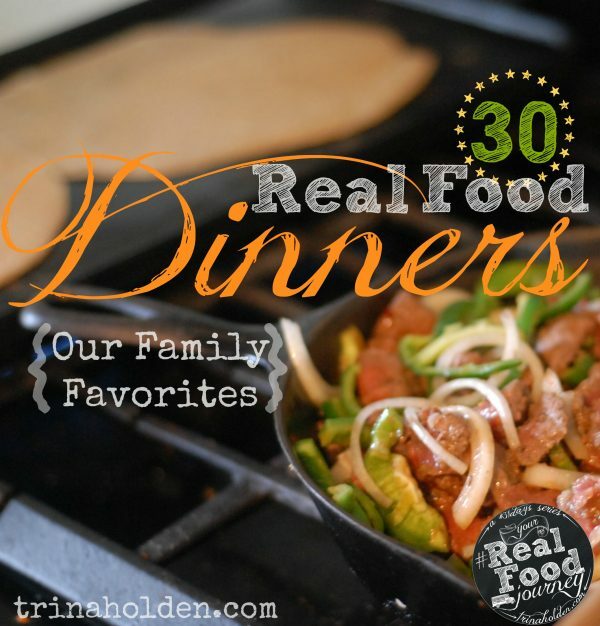 Growing up, we at them as fast as my dad could lift them out of the hot grease and mom could dust them sufficiently with powdered sugar, and it never seemed as if they made quite enough. Making them for my own little family, we actually have leftovers which we enjoy for breakfast the next day. After Ollie Bollen comes another Dutch Tradition. The Peppermint Game. A small stool is chosen — low in height and not over-generous in surface size. It’s key that it hold a man’s weight without tipping. It is set in the center of the room and a single, Dutch peppermint is balanced tantalizingly on the edge of the stool. Anyone is invited to help themselves to the treat, with just a few rules. You must 1)retrieve the mint with your mouth while 2)standing on the stool. You can imagine the entertainment value of the game when friends and family, young and old, flexible and not-so-very, driven by competitiveness or the simple lust for a good peppermint, climb atop the stool. The most common technique is balancing the tips of one’s toes on the edge of the stool opposite the mint, gripping the stool firmly on the sides, and squatting — slowly, to maintain balance — until one’s lips can coax the mint inside. But those without the ability to do a severe squat must often resort to extreme measures, involving precarious hand stands atop the stool and, sometimes, loud sucking noises. Drooling often sets in when one had been at it a while with no success. It’s all quite hilarious to observe. I introduced my kids to the game this year for the first time. Sadly, I didn’t think ahead enough to pick up some mints so we had to use peanut M and M’s. But I had just the right stool and it was hilarious to watch them — first their faces while Mommy demonstrated, then their own juvenile attempts to follow the rules to get their treat. Jesse was a pro — smoothly bending to deftly pluck up the treat — proof of good, strong dutch genes, I said. Claire didn’t quite get it, unwilling to commit to the risk to lower her head below her spine while perched in the air. She ingeniously used one hand to cup the candy a few inches off the stool, then licked it out of her hand, all while giggling. She bounced up like a gymnast her face shining with triumph. Finally it was Daddy’s turn. The kids shrieked with delight while Mommy tried to get photos — Jeremy being one of those who has to use extreme techniques to reach the treat. After this, the family may play a home version of Scategories – we called it “Boy’s Name, Girl’s Name” growing up. It was a list of ten general categories and all that was needed was paper and pen for each person and a dictionary, and a timer. One person opened the dictionary and, with eyes closed, dropped a pencil to the page. Whatever the tip landed on was our letter. We’d set a timer for 3 min. and then race to fill in all the categories with as unique choices as possible, for you only got a point for your word if no one else had thought of the same one. Again, a simple game, but with the dutch (or was it just my family’s?) competitiveness, it was a rousing good time. The dutch, despite their reserved attitude and reluctance to show emotion, have a wonderfully dry sense of humor. My sisters and I used to laugh so hard at my Pake’s jokes when he would come visit. Q: What do the Dutch do when it rains? A: They let it come down. Q: What’s white and has two legs? Q: What’s white and has one leg? Trust me, it’s hilarious if you’re Dutch. I’ve never actually celebrated the New Year with my grandparents as they live across the country, but each New Year’s I feel especially close as to them as our celebrations echo my heritage. Happy New Year to you and yours! I’m curious…how do you celebrate? This has been a unique Christmas Season for our family. As I mentioned in my reasons for a simplified Christmas this year, we drove to Orlando, Florida for a seminar Jeremy was attending, and were gone for 11 days at the beginning of the month. Coming home with just 12 days left to be ready for Christmas — minus 3 days recovering from the stomach flu which hit us on the way home — means Christmas has been even more simply elegant than I’d planned! Can you tell the girl child is so very excited about cookie decorating? Everyone has their helping stools pushed close to the kitchen island while mommy finishes mixing the icing. Mommy scowls in concentration while spreading a sample smear on a sample cookie. Seth presumes this is all for him and begins rooting in excitment. Thanks to Daddy’s deeper reservoir of patience, Seth is permitted to help decorate. In his 16 month-old-brain, this is also permission to lick, pick and eat! Thankfully, Daddy understands his boy, and Seth was permitted to eat his cookie as soon as he finished decorating it! Of course, this spawned the idea that all the cookies were there for Seth’s express enjoyment. Soon after this photo he was whisked off to the bath while his more mature brother and sister continued decorating. I usually have a theme for my tree. This is what a simplified Christmas tree theme looks like. One and a half strands of popcorn garland and half the usual ornaments. And it’s still beautiful. Amazing, isn’t it? I could get used to this…. This will be the last you’ll hear from me till after Christmas, when we’ll enjoy series of short posts highlighting the best content from the blog from the past year, with follow up on a few topics, and a hint of what’s to come in the new year! You knew I was kidding yesterday, right? It is truly my aim each year to simplify our Christmas as much as possible, otherwise I wouldn’t have time for the tradtions that are most meaningful to us. I mean, if I’m wrapping presents till 2 am on Christmas, then I wouldn’t be able to join in on the big, family, sleep-over under the Christmas tree, now would I? 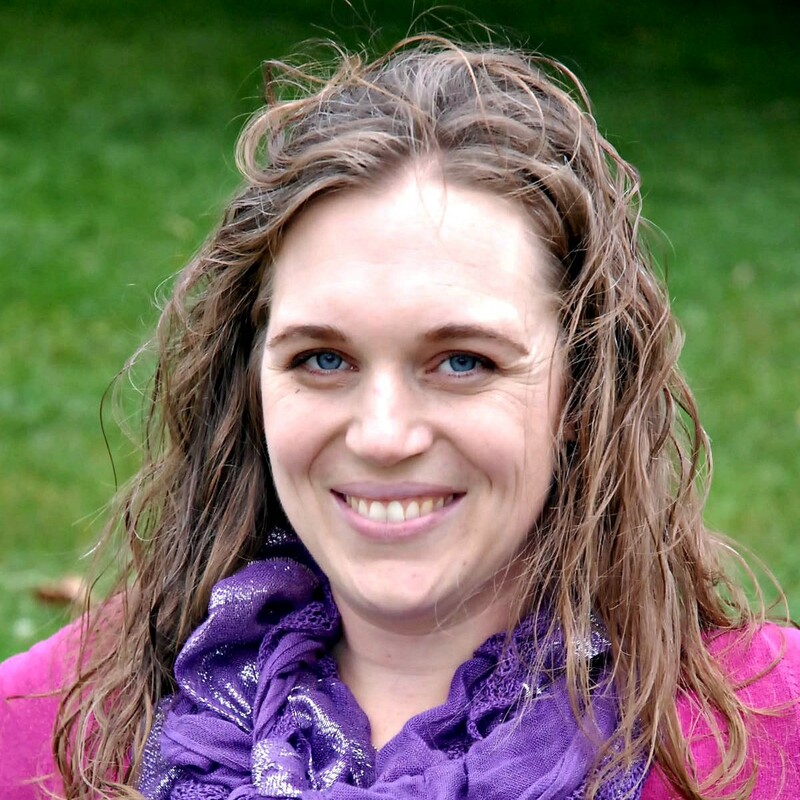 And if I’m spending too much time on everyone else on my list, I won’t have creative juices left for my husband’s all time favorite tradition (which you can read more about over in my post at Passionate Homemaking this week). That would be a crying shame. But I DO love gift giving, and my list is as long as yours of people I love whom I want to bless in this season. So what do I do? Well, at the risk of revealing all my secrets for friends and family this year, I’m gonna share my #1 tip for simplifying Christmas. I call it “One Size Fits Most” gifting. Find a great little something that fits multiple people on my list. Then I just buy or make in Bulk. Amazingly simple, and stunningly efficient. For Kids: Homemade Playdough. Packaged in Jam jars with a shiny new cookie cutter tied around it. So fun and yet simple – you could make a dozen jars in less than an hour, and have gifts for every child under 10 on your list. Check out this cute idea for Candy Cane Playdough from The Artful Parent! For Guys: There is nothing wrong with gift cards, people. (I have to keep reminding myself) Especially for guys. Especially if it involves food. How about a “Five Guys Burgers” card? Mmmmm. I’d like one of those myself. Another great idea? Gloves. This is not corny. I don’t know a single guy who wouldn’t appreciate a nice pair of work or winter gloves. Find them at Lowes or Home Depot in packs and individually wrap a pair for each of your brothers or uncles. For Girls: Have you seen these yet? Oh. My. Word. I received one of The June Bride’s handcrafted felt flowers from the Tiny Twig at Relevant last month, and I’ve been wearing it ever since. I even want to sleep with it. (I know that may be taking things too far, but it’s Cashmere, people – purple cashmere!) Her flowers are exquisite, reasonably priced ($12-$15 each, compared to some I saw in a boutique last month for $22!) and would work for young women and mature ladies both! Oh, and free shipping. Yes. Perfect. 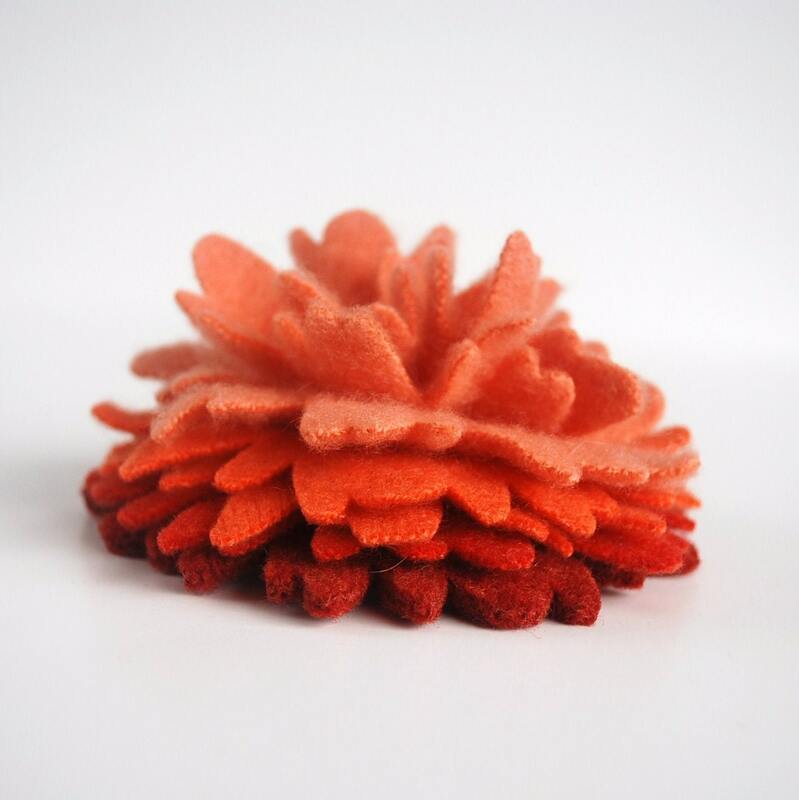 Pin to your winter coat, snag it on a scarf, or accessorize your favorite purse! OK, I’ll stop raving now. Are we done yet? Have you got something for everyone now? Still a few gaps? I know just what to fill it with. I’ve got one more “One Size Fits Most” gift to share with you, but I’m gonna hold off till tomorrow. Can you stand it? It’s gonna be worth it, ’cause I’m gonna share my biggest secret yet. ‘Cause I love you. And I want you to enjoy Christmas, ya know? Do you do any ‘one size fits most’ gifting? What are some of your favorite gifts to give? Do you ever give the same gift year after year?